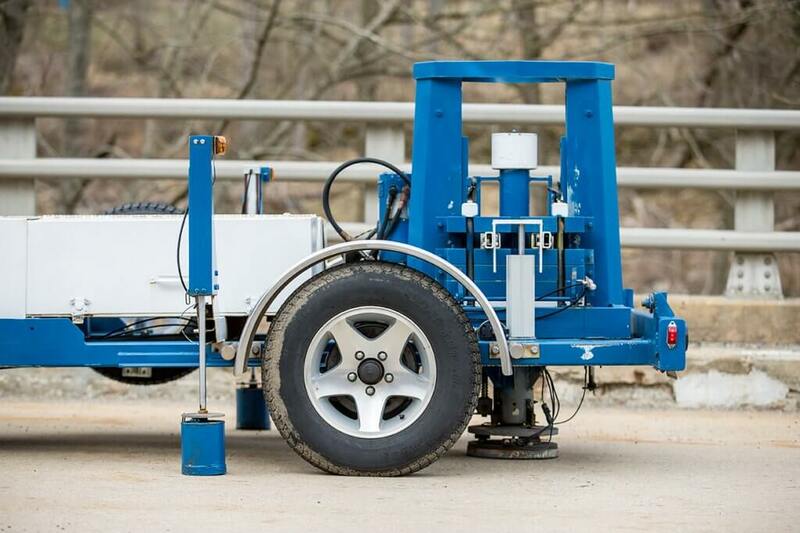 THMPER™ is the first portable, self-contained system for evaluating bridge load capacity by combining modal impact testing, refined analysis, and calibration of finite element models. It uses custom software to process test data on the spot, making it a fast, efficient, accurate, and economical. 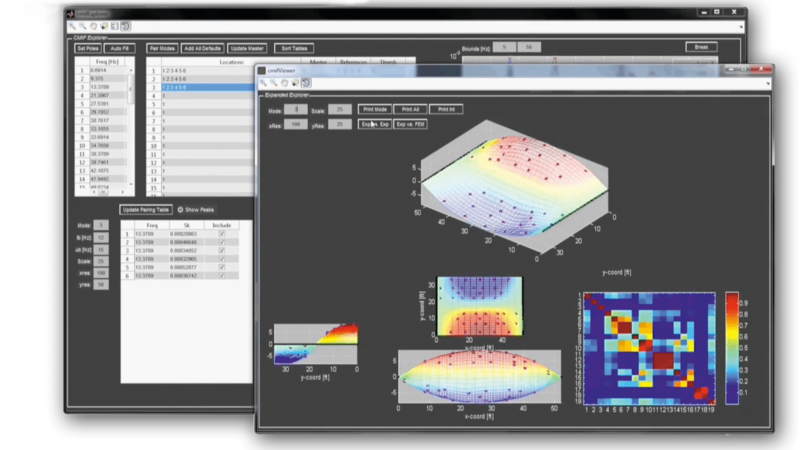 The Targeted Hits for Modal Parameter Estimation and Rating (THMPERTM) system is the first technology of its kind. As its name implies, the device delivers a forceful impact to the bridge, causing it to vibrate. That vibration response reveals a lot about the bridge’s load capacity. THMPER’s drop weight (just behind the back wheels) strikes the deck, causing it to vibrate. Sensors record the bridge’s response; after being processed and analyzed, the data indicates how much load the bridge can safely carry. Photo: ©Drew Noel Photography/Rutgers CAIT. 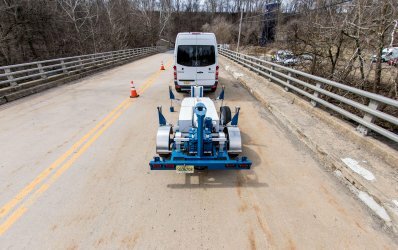 The methods and practices that THMPER combines—modal impact testing, refined analysis, and calibration of finite element models—are noted in the AASHTO Manual for Bridge Evaluation as accepted standards for determining bridge load ratings. But THMPER combines all three approaches in one platform that is portable, fast, cost effective, and accurate. THMPER’s pistoned drop weight delivers a concentrated impact, generating a vibration response in the bridge. The concept is somewhat analogous to plucking a guitar string and then recording its distinct vibration profile. Capturing the frequency of the vibrations and the shapes the bridge assumes at various frequencies provides key performance measures regarding the stiffness and mass of the structure. 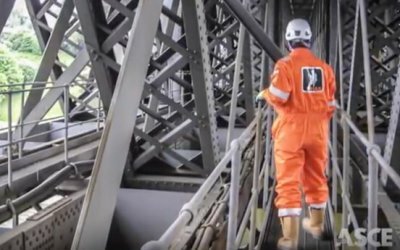 The crew “thumps” the bridge at predetermined locations across the span, and sensors record its dynamic vibration signature. THMPER is particularly good at picking up key aspects of the bridge’s response in the torsional and so-called butterfly mode, i.e., how the girders share the load transversely. 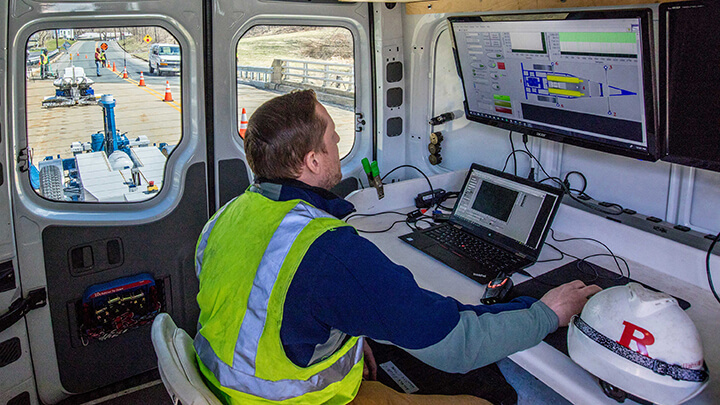 Sensors feed the recorded information directly to a technician in the control van. There, the data are processed and applied to calibrate a refined finite element (FE) model, which in turn indicates how much load a bridge can safely carry. THMPER provides quantitative data that accurately represents a bridge’s load capacity. 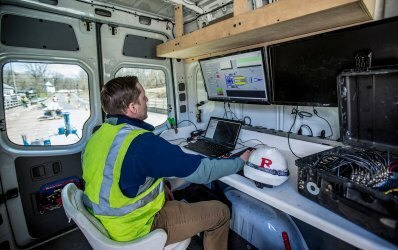 It can test a 100-foot-long, three-lane bridge in about 45 minutes and can evaluate an estimated 300-plus bridges per year at about 25 percent the cost of current testing methods. Plus, it minimizes traffic disruptions. With all of that going for it, THMPER could revolutionize how America’s 600,000-plus bridges are regularly assessed, rated, and prioritized for repair or replacement. THMPER is a portable, self-contained testing device with onboard computers that can receive and process the data onsite, allowing it to deliver test results faster than other current methods. Photo: ©Drew Noel Photography/Rutgers CAIT.